What could be better than watching the natural world out your window or on your television? Going out and experiencing it firsthand. In these fifty essays, acclaimed nature and science writer Sy Montgomery takes her readers on a season-by-season tour of the wilderness that is often as close as the backyard. Sy invites — almost dares — readers to follow her and form hands-on relationships with the plants, animals, birds, and even the insects that share space with people. These essays, most of which originally appeared in Sy’s Boston Globe column Nature Journal, are by turns enlightening, entertaining, sometimes amusing, and always absorbing and informative. Filled with natural history and lore, the essays urge readers to appreciate what they find around them. Writing about nature has its hazards. Researching other books, I’ve been chased by an angry silverback gorilla in Zaire, bitten by ants and chiggers in the Amazon, robbed by an orangutan in Borneo (who then chewed up the interview tapes she had stolen from my backpack) and hunted by a tiger in India. I got dengue fever in Kalimantan, dysentery in Bangladesh, and strep in Laos. Landmines and robbers were a problem in Cambodia. This book, though, was a piece of cake. North America is great. You don’t have to get shots, snakes don’t crawl into your bed, poisonous caterpillars don’t drop out of trees, the trees don’t exude toxic sap, and, for half the year, there are no mosquitoes. And yet here, you can find creatures, landscapes, and natural phenomena as strange and mysterious as in any jungle. Beneath your porch, creatures with their skeletons on their outsides and their ears on their knees are singing with their wings. In your backyard, songbirds may be murdering mice, while on your lawn a battle rages between exotic and native species. All around us, extraordinary dramas unfold daily: Bluejays are replanting forests. Baby turtles are launching epic journeys. Voles are warring like gladiators. Plants are eating animals. And it’s getting better all the time—-at least in New England, where these essays were originally researched and written as columns for The Boston Globe. From beavers to eagles to moose, wildlife once extripated is now returning to the area, as forests recover from 100 years of clear-cutting, unsustainable farming and unregulated hunting. This gives us the chance to glimpse animals our parents might never had seen, like otters and fishers. At the same time, new animals are moving into our area: southern birds are expanding their ranges north. A new ladybug for Asia is swarming into houses. Coyotes are appearing in our fields. It’s an exciting time to be watching the natural world, as well as a crucial opportunity: we now have a second chance to save what we nearly destroyed. And that is the ultimate aim of these essays: to urge readers to cherish, savor and preserve a natural world brimming with unexpected beauty, drama and complexity. Our lives are surrounded by ordinary miracles, everyday mysteries. To find them, all you have to do is indulge your senses. Follow the scent of the earth outdoors on a cool, wet morning in spring. Savor the taste of sun-drenched dewberries picked in the wild. On a hot August afternoon, go down to your local pond and inhale the scent of flowering water lilies. On a cool autumn night, let the moonlight call you outdoors to listen for the voices of migrating birds overhead. In other words, be a hedonist. Look out your window, find something wonderful, turn off the screen you’re watching or reading and go outside. You’re sure to discover something wholly unexpected. The more you watch, the deeper the natural world will draw you into its mystery and magic. 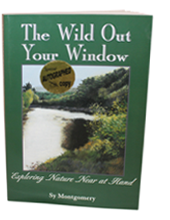 “Insightful, poignant, filled with reverence and wonder for the splendor of the world, The Wild Out Your Window is a ‘must read’ for both armchair travelers and active nature enthusiasts. This spring, you’re sure to spot a literary celebrity in our midst. With a velvety coat, whiskered snout and big, cartoon-like hands, the mole, scurrying across the road, racing rhought he grass, or making shallow tunnels in newly-dug gardens, looks just like its famous namesake from The wind in the Willows. Gardeners and greens-keepers detest the molehills and tunnels, but the mole itself—soft, small, seeming to squint Mt. Magoo-like the in the sun—-is almost irresistibly charming.